Fifteen-year-old Stephen Quinn was born into a life he never dreamed of; a life of scavenging to survive. America is has been torn apart after a brutal war against china, were more than half of the population has died from the sickness, the Eleventh Plague. Fortunately, Stephen and what is left of is family, our one of the few survivors left salvaging for materials to trade. Soon things start to collapse, as he grandfather dies and his dad goes into a devastating coma after a huge accident. Life was tough before, for Stephen, but this make it utterly worse with him realizing he is now on his own. Struggling to it make, he uncovers Settlers landing; a community that seems too good to be true. Just as Stephen starts to feel more accepted, him and his new friends execute a prank that goes terribly wrong. Just as things were getting better, a battle breaks out and what seemed to good to be true starts falling apart, changing Stephens’s life and Settlers landing forever. 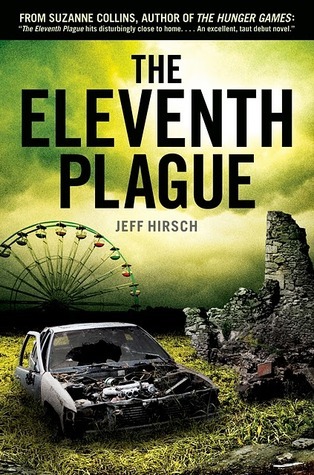 The book “The Eleventh Plague” written by Jeff Hirsch was a well-paced story that has an amazing surreal world that could honestly become our future. I’m saying that because are world everyday is getting less depleted with resources such as water, food, fossil fuels and one day it will get to the point where there all gone and without them the whole planet will just collapse creating a complete wasteland like America in the book. This book really triggered my emotions as I read about the problems Stephen had with his grandfather dying and without having a functional dad. It reminded me when my grandmother died and how stressful it was for my family and it made me wonder how Stephen could cope without having any one to point him in the right direction. This book really called out to me when I first picked it up in the library, I don’t know if it was because Suzanne Collins gave it an terrific review: “The Eleventh Plague hits disturbingly close to home….An excellent, taut debut novel.” Or it was because the main character seemed to relate to many other characters from stories I have read like Katniss (Hunger Games), Thomas (Maze Runner), Alex (Alex Rider), because there are all forced to deal with mature situations that no one should ever have to deal with. All I really knew was that this book seemed like it was going to become a best seller, so I made sure I bought the book before there all sold out. I really enjoyed this book and I would love if they made a sequel and a prequel, just to see how they survived before reaching Settlers landing and to see what next event occurs in America, maybe Canada helps rebuild what America once had. I would recommend this book to youth kids that still have a powerful imagination and are always wondering what if. Also to kids that love reading books that hook you in so much, that you forget about the world around you and just picture the book in your head and see the story through a character shoes. By the way, I also think that you did a great job in your critique because it seems that you deeply connected with literature. Once again, good job! You are one of the few people that connected the main character in your book to a main character in another book. I find your connections quite interesting and I would agree with them. Your summary paragraph is really attention grabbing and makes the reader want to read this book. Great job!